Dixie Elixirs combines two of the best things in the world, Birthday Cake, and THC. 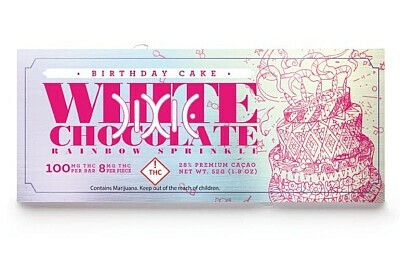 Their Birthday Cake Chocolate is 100mg of classic vanilla cake with cheery and delicious rainbow sprinkles. Each delectable piece is 8mg of THC and sweet relief. Even better news is that all of Dixie Edibles are lab tested, ensuring the most quality as well as delivering phenomenal taste. INGREDIENTS: White Chocolate (Sugar, Cocoa Butter, Powdered Milk, Soy Lecithin [Emulsifier], Vanilla Extract), Non Pareils (Sugar, Dextrin, Starch, Titanium Dioxide, Confectioner’s Glaze, Carnauba Wax, FD&C Red #40, FD&C Red #3, FD&C Yellow #5, FD&C Blue #1, FD&C Yellow #6), Natural Cake Flavor, THC Oil.